Fredricks Communications recently had the pleasure of working, once again, with Burnsville, Minn.-based SnowWolf, for the release of its latest innovation, the QuattroPlowHD. FredComm created a press release for the new attachment and developed headline/content for a series of social media posts. SnowWolf is a highly innovative leader in the snow-removal equipment market. Over the years there have been many “industry firsts” from the company. The QuattroPlowHD is a 4-function-in-1 snow-removal attachment for use with heavy-duty equipment such as wheel loaders, tractors and backhoes. In 2016, FredComm worked with SnowWolf on a wide range of materials for the introduction of what at that time was its latest “first,” the QuattroPlow, a 4-function-in-1 snow-removal attachment for skid steers. The QuattroPlow is a high-capacity, hydraulic angle snowpusher, angle plow with wings, wide-angle plow with wings and backdrag plow, all in one. The theme of the campaign was “4x the Plow,” and it was highly successful. 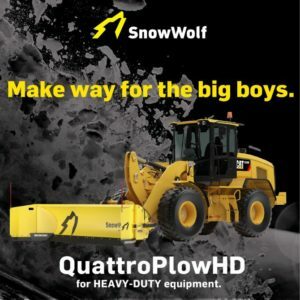 SnowWolf executives said it was “an out-of-the-park homerun”; QuattroPlow sales exceeded sales of all other SnowWolf snow-removal attachments and accessories combined. This year, SnowWolf incorporated the concept into its design for the beefier 4-in-1 attachment for larger machines. Congratulations, SnowWolf! I hope the sales on the QuattroPlowHD are just as good, if not better, than what you saw with the QuattroPlow last year.